The SMKPP Centennial Gala Dinner held last Saturday 20 September 2014 was a night to remember. I was glad that all four of my sisters attended the historic occasion. Photos are still being shared by thoughtful friends, and as I was looking at them, I was able to pick out five past Vandort Shield winners. (L-R) Ms. Lee Chii Nuo (1972 recipient, who became a teacher and dedicated her life to PESS and will retire next year) with my classmate SQ; Lim Ooi Meng (1985 recipient) with my classmate NC; Kong Soke Yue (1987 recipient) with SQ, at SMKPP Centennial Gala Dinner, 20 Sept 2014. (L) My dear friends – NC, LL, WK and BM – in another photo with Ooi Meng… I suppose this made up for missing OK, another one of our good friend who is in Australia. 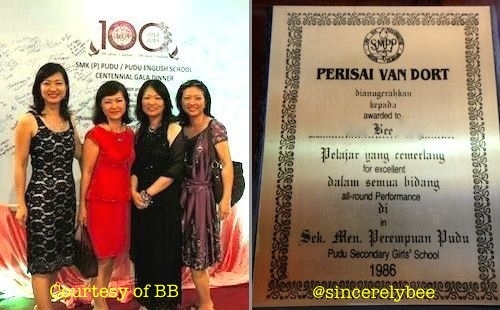 And now I see the lovely shades of pink and purple, and black too 🙂 ; (R) From my sister’s batch, 1981 Vandort Shield recipient Miaw In (left in pix) with a friend, at the SMKPP Centennial Gala Dinner, 20 Sept 2014. 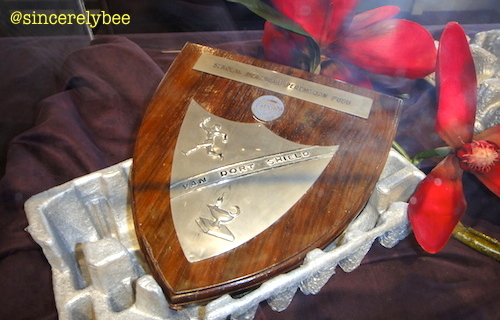 (L) A family of four librarians, three school chess players, three prefects, two assistant head girls and a Vandort Shield winner (Bee Buan, 1984 recipient). (R) And the 1986 recipient shared their moments from Africa. 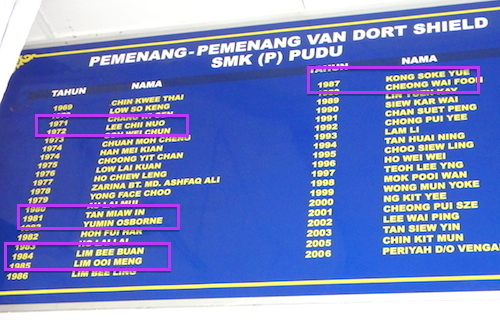 The list of Vandort Shield recipients in the school hall. (Taken on 21 Sept 2013). This entry was posted in Happy at Home, School Days and tagged Family, Friends, Home, PESS, School. Bookmark the permalink. Thanks for a good memory shared, BeeLing.